1901, Prussia, Wilhelm II. 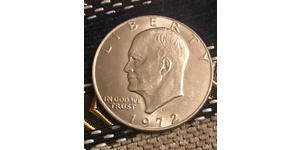 Silver 2 Mark “200th Anniv. 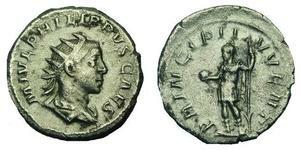 of the Kingdom” Coin. 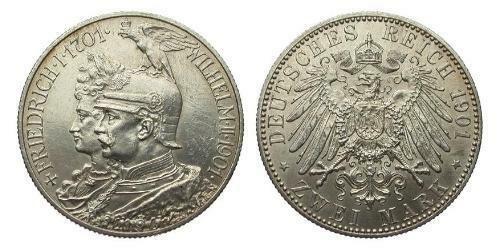 Obverse: Conjoined, armored and draped busts of Emperor Wilhelm II (helmeted) and Frederick I of Prussia (wreathed) left. 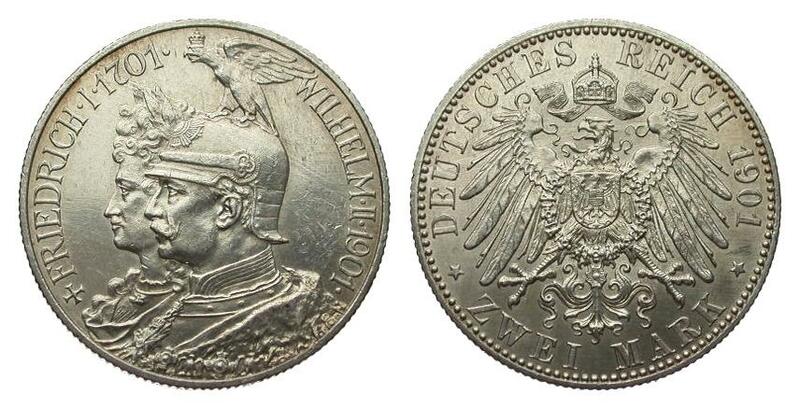 Reverse: Crown of the German Empire above heraldic eagle of Germany with prussian shield at chest and star order. For your consideration a beautiful commemorative 2 Reichsmark coin issued to commemorate the 200th anniversary of the Kingdom of Prussia. We see here the conjoined busts of Frederick I, who was the 1st King of Prussia and Wilhelm II as German Emperor and current King of Prussia, which shows the consistency of the Prussian Kingdom on its 200th Anniversary. 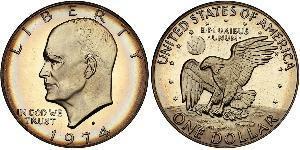 A nice commemorative issue with proofl-like reverse! Wilhelm II (German: Prinz Friedrich Wilhelm Viktor Albert von Preußen; English: Prince Frederick William Victor Albert of Prussia) (27 January 1859 – 4 June 1941) was the last German Emperor and King of Prussia (German: Deutscher Kaiser und König von Preußen), ruling both the German Empire and the Kingdom of Prussia from June 15, 1888 to November 9, 1918. The German Emperor Wilhelm I died in Berlin on 9 March 1888, and Prince Wilhelm’s father was proclaimed Emperor as Frederick III. He was already suffering from an incurable throat cancer and spent all 99 days of his reign fighting the disease before dying. On 15 June of that same year, his 29-year-old son succeeded him as German Emperor and King of Prussia. Although in his youth he had been a great admirer of Otto von Bismarck, Wilhelm’s characteristic impatience soon brought him into conflict with the “Iron Chancellor”, the dominant figure in the foundation of his empire. The new Emperor opposed Bismarck’s careful foreign policy, preferring vigorous and rapid expansion to protect Germany’s “place in the sun.” Furthermore, the young Emperor had come to the throne with the determination that he was going to rule as well as reign, unlike his grandfather, who had largely been content to leave day-to-day administration to Bismarck. Early conflicts between Wilhelm II and his chancellor soon poisoned the relationship between the two men. Bismarck believed that William was a lightweight who could be dominated, and he showed scant respect for Wilhelm’s policies in the late 1880s. The final split between monarch and statesman occurred soon after an attempt by Bismarck to implement a far-reaching anti-Socialist law in early 1890.